Standard Deviation in Mutual Funds will tell you how risky is particular fund. While choosing a Mutual Fund – Return is not the only criteria; we have to check Risk-Returns, Tax, Inflation, Liquidity etc. There are few more scientific formulas that help one to choose fund – we will be covering them at some later stage. Thumb Rule: Higher the Standard Deviation of Mutual Fund – Higher the Volatility. If you are really serious about fund analysis, you need to understand this is all about judging returns and risk. Stripped of a lot of the complexity, this task involves determining a fund’s average performance over a period of time. Let’s get down to basics and take a refresher course on this concept. Why do we use an average? Why don’t we use the actual numbers that the average is calculated from? Obviously, because an average gives us a single value that represents the numbers it is calculated from. It is far easier to use a single number for judgments and comparisons. But like most things in life, averages can be both good and bad. They can be trustworthy, or they can be worthless, or they can be anywhere between the two. For example, the average age of children in a nursery school is three years. You could walk into a kindergarten expecting most kids to be more-or-less three years old and you would not be wrong. However, the average age of students in a school is 12 years. You could walk into a school expecting most students to be more-or-less 12 years old and you would be almost completely wrong. Around 90 per cent of the students would NOT be 12 years old — they would be all ages from 5 to 18 years. What happened? Was the average wrong? Obviously not, but it was not a very useful figure. It would have been far more useful if you had been told that most of the individual ages in the kindergarten were close to the average but most of the individual ages in the school were far from the average. Standard Deviation – Is the average deviation from the mean returns. It’s an indication of volatility i.e. deviation from mean returns. Calculation – Square Root of Variance. Where Variance is the average of the squared deviations from mean returns. Oh! Sounds complex – if you use excel it’s very simple to calculate. Check below picture. 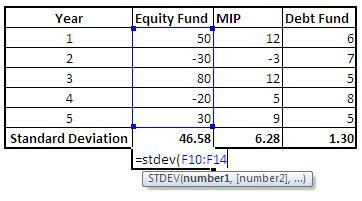 You can clearly see Standard Deviation of Equity Mutual Fund is higher than Debt Fund. This is exactly what Standard Deviation does. It gives you a ‘quality rating’ of an average. The Standard Deviation of an average is the amount by which the numbers that go into an average deviate from that average. It tells us how closely an average represents the underlying numbers. Let’s put it this way: There was very little risk in assuming that the kindergarten’s average represented the real ages but there was a great deal of risk in assuming that the school’s average represented the real ages. 1. Calculate a fund’s monthly performance over a long period of time. 2. Calculate the average for all these monthly performances. 3. If the individual monthly performances are very different from the average, then that fund is risky, delivering high returns in some months and poor returns in others. If they are mostly similar, then the fund is a low risk one, with about the same returns month after month. Mutual Fund Standard Deviation: In above table you can notice that in equity category midcap, sector & multicap funds have higher standard deviation if we compare it with large cap of balanced funds. MIP & Gold is showing low Standard Deviation. In Debt fund category Gilt & Income have higher volatility than Liquid Fund. But you do need to be careful of one thing — a high Standard Deviation may be a measure of volatility, but it does not necessarily mean that such a fund is worse than one with a low Standard Deviation. If the first fund is a much higher performer than the second one, the deviation will not matter much. For an original and unforgettable illustration on Standard Deviation of Mutual Fund, try and compare the Standard Deviation of Sachin Tendulkar’s batting average with that of, say, Zaheer Khan’s! Note: This post was published on TFL – Sep 2011. I was wondering why you have given examples of old Reliance funds. Now I know this is an old post. I don’t mind reading old posts because they are so good.